There is a John Tory who has lived in the imaginations of progressive Torontonians. The not-always-whispered hope was that this mild-mannered, news radio nebbish was awaiting the right moment to reveal the social justice Superman suit concealed by his shirt and tie. That the former Bill Davis pupil could be a kind of Pied Piper to suburbanites and car drivers and Bay Street red Tories, playing a tune they recognized and felt comfortable with while ridding the city of the influence of the brothers Ford. Pick your analogy: Nixon going to China, St. Paul on his way to Damascus, Andre the Giant turning on Bobby Heenan at WrestleMania VI. 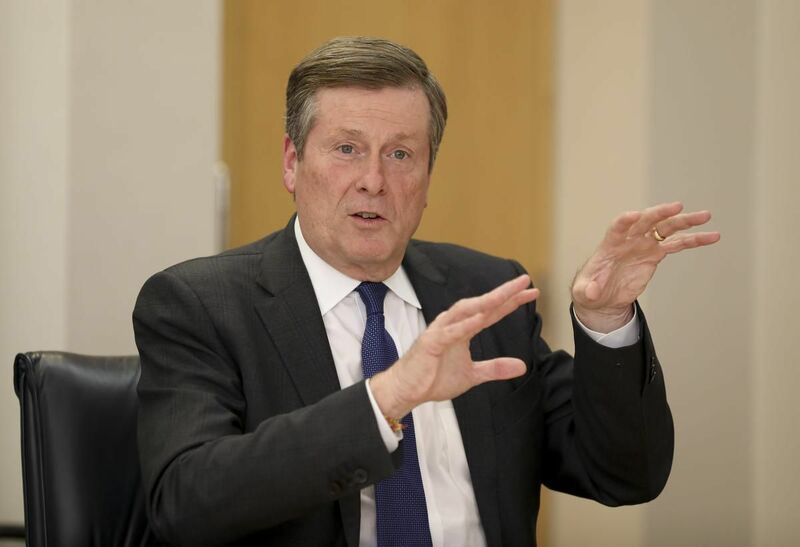 My colleague Shawn Micallef expressed his version of this recently, when he said he’d been waiting for Tory to channel his “inner Bloomberg” to dramatically push through big changes quickly. The John Tory of some leftists’ dreams does not exist. You’d have to think if the big reveal was going to happen, we’d have seen it by now, as Tory cruises toward a second term with little or no competition to his right, a political piggy bank overflowing with capital, and a political legacy ready to be finally written. The closest he came was when he tried to implement road tolls on local highways. It was an unexpected move, one that was bound to alienate many drivers, one that acknowledged the need for funding beyond what inflationary property tax increases can provide. It didn’t work. The Liberal premier of the day spiked the idea, and promised $170 million in gas-tax revenue instead. Tory points to that frequently to refute another imagined version of himself: the right-wing bogeyman, “Ford with better manners.” He proposed those tolls, and he did raise property taxes beyond inflation by implementing his phased-in 2.5 per cent city building levy, and he did raise land transfer taxes by harmonizing them with the province, and he did implement a hotel tax. Tory also can — and does — point to the Bloor bike lanes, the King streetcar pilot project, the opening of safe-injection sites, the restoration of bus service Rob Ford had cut (and the addition of more in some places), the revival of the Eglinton East LRT and the planning and design work that’s started on the relief subway line, the anti-poverty and Vision Zero plans, the creation of a strategy to confront anti-Black racism, and the injection of new funds into TCHC repairs. The list is longer than that, but you get the idea — they all exist now, even if critics think they are coming along too slowly. For each of those, of course, progressive critics — like me, most days of his term — can and do point to his failure to implement a stormwater charge to properly deal with flooding, his refusal to help people replace the lead pipes in their homes, the massive waste of resources trying to hold back the tide of traffic congestion by making traffic flow better and faster (even at the seeming expense of his stated safety goals), the reactive rather than proactive approaches he took to an entirely predictable crisis in the homeless shelter system, and the overdue end of police carding. They can point to his habitual, needless antagonism toward council’s progressives — which began in his first days, when he shut them out of positions of influence, and has extended to portraying people like Joe Cressy as “radicals” during this campaign, even though in talking to the Star this week he claimed he didn’t realize his official campaign communications were using that language. You add all that up and you get that he’s been — and can be expected to continue being — pretty much the same guy he’s always claimed to be. With very few notable exceptions, he appears to take the path of least political resistance. Well-mannered, civil, a manager; generally eager to get along, middle of the road, a little progressive but fundamentally conservative. But on the two biggest issues he confronted in his term, he was also something else: wrong. The one-stop extension of the Danforth subway line out to the Scarborough Town Centre, and the rebuilding of the eastern end of the Gardiner Expressway. These two issues continue to occupy an outsized place in the city debate, partly because of the narrative symbolism both carry (inner-suburban alienation and how to deal with it; car infrastructure versus other kinds) but also because they are massively expensive, and they are the kinds of huge city-building decisions that will define the kind of city we are in the decades to come. To be sure, on each of those issues, Tory sought a middle-ground compromise of sorts (one-stop-with-LRT-too; revamped hybrid to open up the Keating Channel), but those expensive compromises amounted to ways to soften the wrongness of the main decisions. It is helpful, for progressive voters assessing whether to give him a second term, to put both the Superman of their dreams and bogeyman of their nightmares out of their minds. The real John Tory revealed himself in his first term. He has repeatedly promised that’s who he’ll be in his second term. By now, we can probably assume that’s the mayor he’ll continue to be.